Imagine this 16' tall salesman standing on the roof of your store, or in front of your car dealership. He doesn't eat much - just a little electricity - he doesn't complain, and he never asks for a raise. 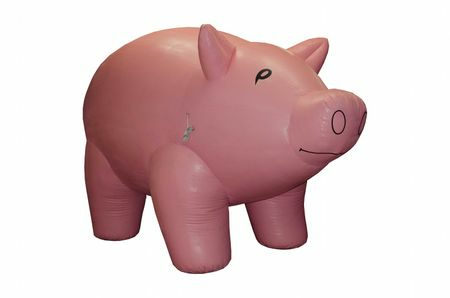 Drive business to your store by drawing maximum attention to drive by traffic with this giant inflatable pig. Made of high quality 7.5 oz. coated nylon. The entire inflatable is completely double stitched with extra heavy 207 thread for long life. Four anchor points on the front and four on the back with anchor points on his feet for easy installation. This giant inflatable pig will draw attention to your business. Increase your profits by driving traffic to your store.